Thrift shopping has been given a facelift at Le Marché Noir. Selling vintage pieces from around the world, you can be sure to pick up a unique item from their eclectic and colourful collection. The store is worth a visit in itself, their rustic, African inspired decor and tea room for you to enjoy refreshments whilst you shop. This boutique is one of the most iconic shops in Paris. 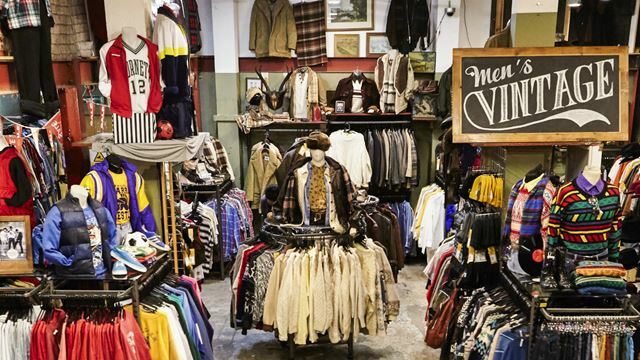 Spread over two floors, it’s a treasure trover dedicated to quality vintage clothing. Their collection is diverse, so there is something for all tastes and budgets, from rare high end brand names, to tickets at bargain prices! This well known vintage store comes with a twist, you pay for your findings by weight! Each item has a colour tag which corresponds to the price of that item when you pay for it. You are guaranteed to find some real retro gems in this place, and the chance to pick up a real bargain- if it doesn’t weigh too much! Marche aux Puces is the biggest flea market in Europe, covering 7 hectares, which is full of vintage stalls and boutiques for you to rummage around for some guaranteed interesting and unique finds! If you’re looking for luxury big brand names such as Chanel and Dior, Studio W is the place for you! Unlike many of the other vintage stores in Paris which sell a range of items, this little gem is dedicated to vintage designer clothes. It is quite the shopping experience to look through their selection of items from true icons of fashion!